Are you setting up a homework station? Or perhaps your child would like to bring a “Back To School” gift to their new teacher. 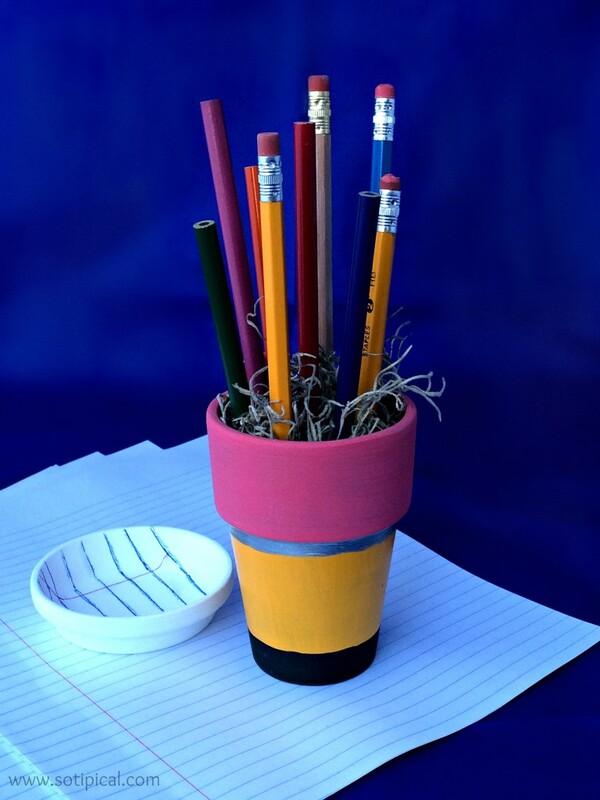 This DIY Pencil Holder is so simple and affordable to make! A few weeks ago, my mom was visiting. The girls wanted to do some crafting with grandma and before you know it, we were in a 3 generation crafting challenge! We could each spend $5 for supplies, plus whatever else we had at home. I ended up with supplies to make two crafts. The one I used in the challenge was some pens that I decorated, but I also saw this small flower pot on sale and I knew that I would be making this cute pencil holder too! First I began by painting the pot pink and yellow. The pink is the “eraser” and the yellow is the “pencil”. Once my two coats were dry, I taped off just over 1/4 inch below the eraser for the silver band. 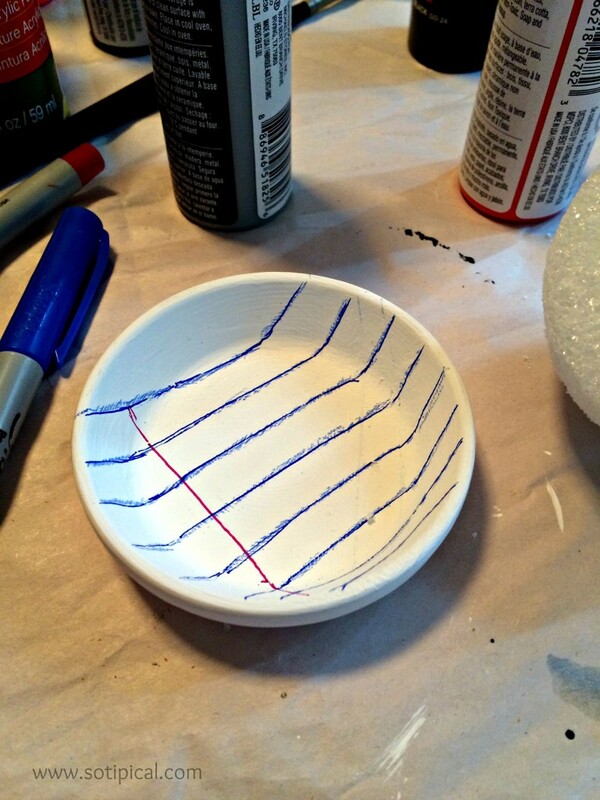 I carefully added the tape in a straight line around the pot, then painted the area silver. Next I taped off about 1/2 inch at the bottom to paint the pencil “lead”. 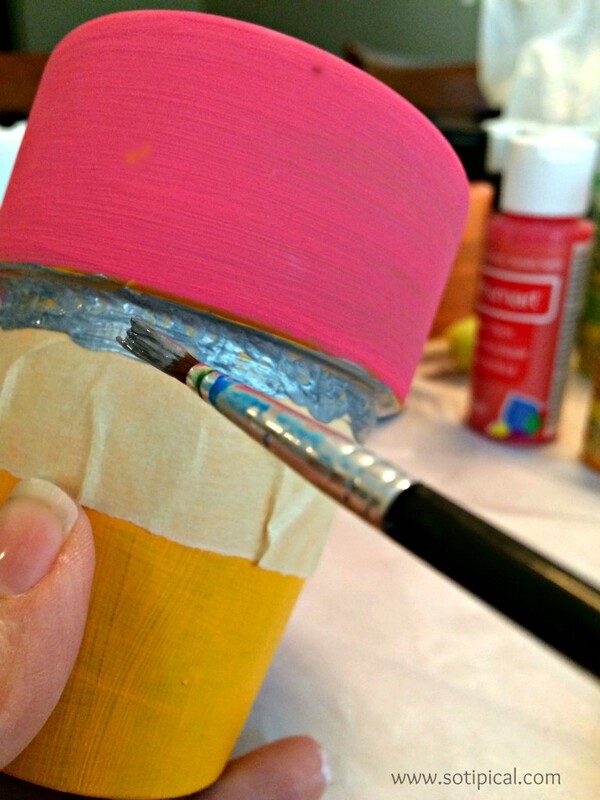 Again, you’ll want to carefully add the tape in a straight line, then firmly press the tape down so the paint doesn’t bleed through underneath. I used black paint for the bottom. 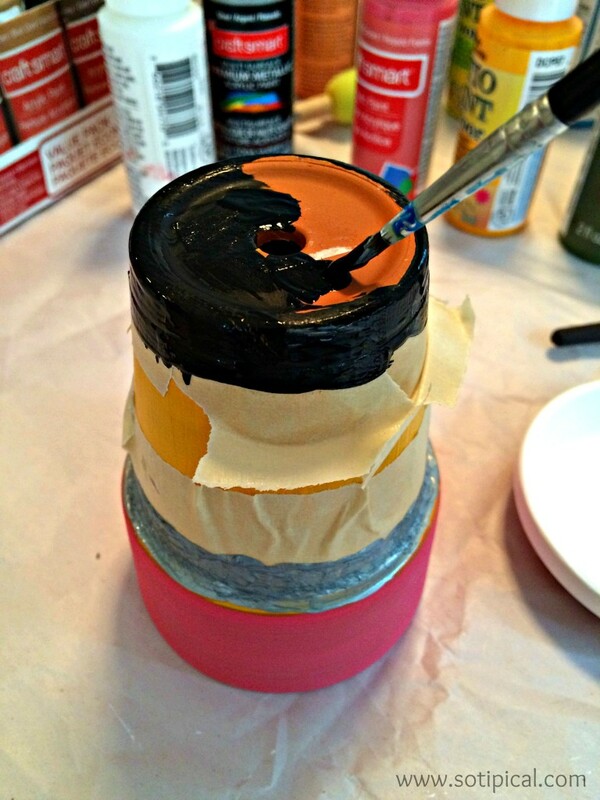 Once you finish painting, carefully remove the paint and continue to dry completely. If the paint bleeds through at all, you can touch it up later. You’ll need to paint the drain pan too. I was going to paint it black, to blend in with the “pencil lead”, but my daughter though it would be cute to paint it like notebook paper. We painted it white and she drew the lines with sharpies. * We actually repainted it a couple of times. At first we tried painting straight lines, but it didn’t come out well at all. You can see that the sharpie lines bled. I think we should have waited for the white paint to dry more before we attempted to draw over it again. 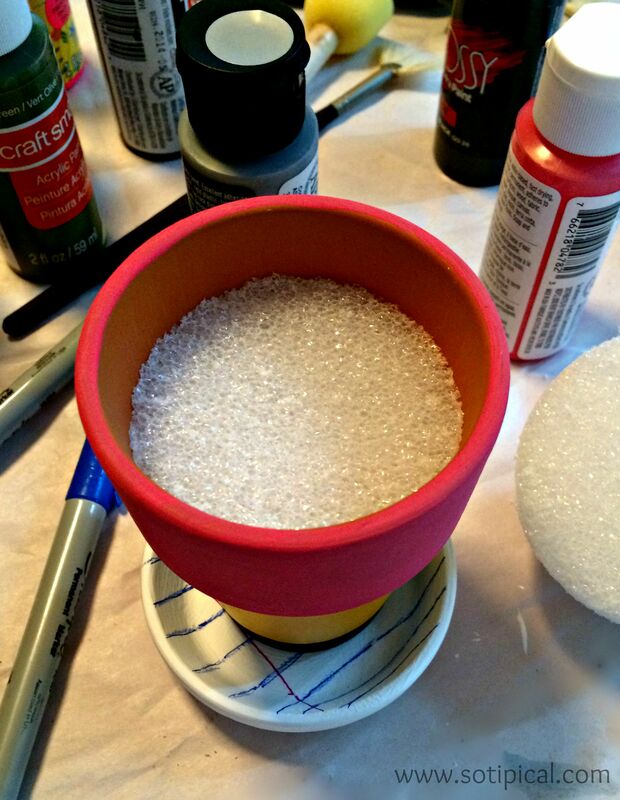 Next you will measure and cut some styrofoam or floral foam to place inside the mini flower pot. Press the foam into the pot. Top with moss. 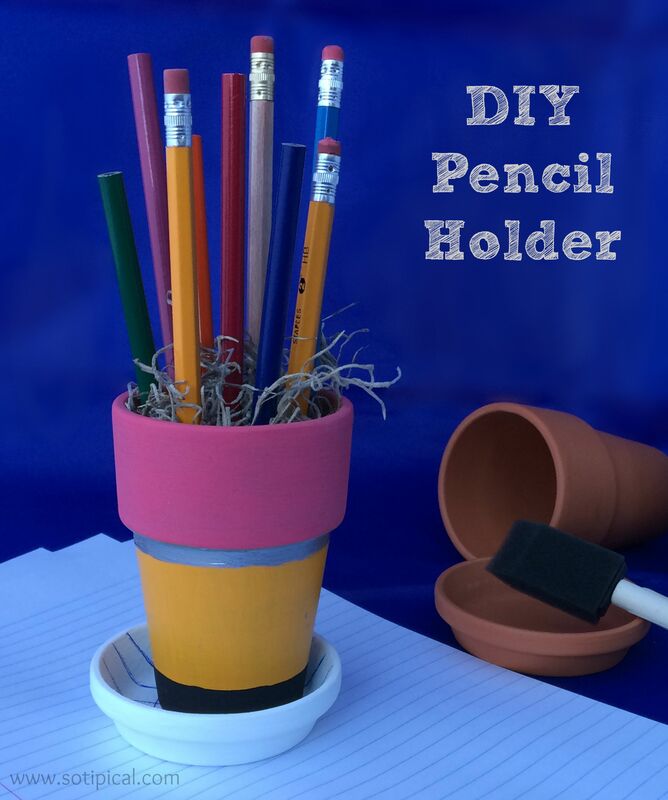 Now you are ready to fill your DIY Pencil Holder with pencils and pens! This is too cute.I’d love to do it with my son.